Welcome back to the Dark Ages! I have now confirmed that there are indeed issues with playing old save files in the new patch by wandering the halls of the Paradox Fora and leafing through the tomes and commentaries displayed on the shelves. The main issue seems to be with levies and income not matching up as they should and so we will be starting over. Happily we haven't even started properly and will not loose any progress. "I feel like a new man!" 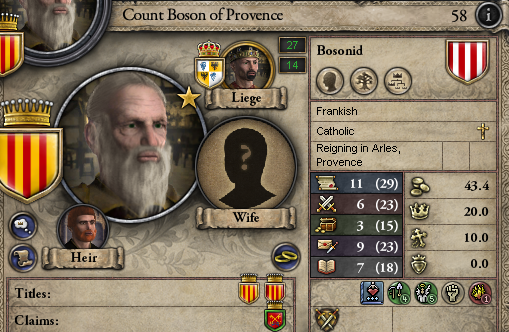 With the new game comes a new count, or at least the same count with new abilities and traits. To save some time I've prepared two scrolls with the details of the two most important characters, namely the count himself and his heir. While our two main protagonists are still much the same there are some notable changes. Our notably just count has had a change of heart and has become a lustful man with substantially weaker abilities compared to his earlier self. The new count is still rather diplomatic but has lost all his acumen and has thus a poor hand with money. The only two improvements to be found are to his skill as a commander of battle and his learning. However, they are still not close to making the family proud. While the old man has been weakened as a result of the change, the younger man has become stronger. 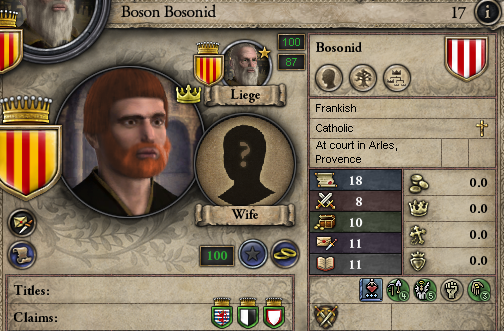 Our new Boson Bosonid is an even more well versed than his old self and while he has lost some skill at intrigue he has gained a considerable amount of learning and so has become a most worth heir. However, to his sins must be added the new hairstyle which looks a lot like a modern combat helmet. It is now time to finally start this Let's Play and see what our fate in this new world will be. Ignoble defeat, imprisonment and obscurity in the annals of time or a glorious future with the name Bosonid echoing between the four corners of the Earth? It is all in our hands!